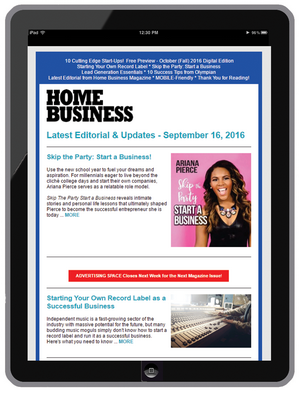 Advertise in the Home Business Newsletter - the industry's top newsletter. Make a direct connection to over 50,000 home-based entrepreneurs! Optional: If Linking to different URL, Enter that URL here. Be an Ad sponsor in Home Business Magazine's Newsletter. Reach 50,000+ Subscribers! Embed your marketing message direct into the home business industry's #1 Newsletter. 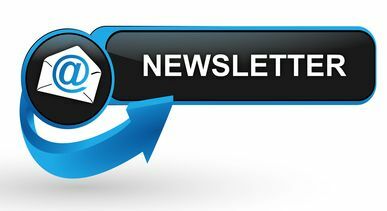 The Home Business Newsletter delivers our latest editorial direct to motivated home-based entrepreneurs and opportunity seekers. The Home Business Newsletter is also "mobile-friendly" and fully readable on all mobile phone devices. Newsletter is managed by industry-leading Constant Contact, to assure the highest levels of spam compliance, "deliverability," and engagement. For information on advertising in Home Business Magazine or on Home Business Magazine Online, please email advertise@homebusinessmag.com . Copyright HOME BUSINESS MAGAZINE. All Rights Reserved. eCommerce Software by 3dcart.